The electoral hustings for the GLA elections; Alix Stredwick’s report on Ice Cream Ride. 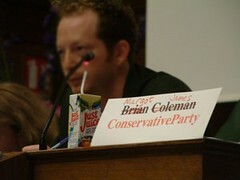 CCC held its hustings on Cycling and Walking in Camden and Barnet in the council chamber in Camden Town Hall on May 19th. Paul Gannon opened the meeting with a slide show illustrating the challenges (such as pollution, congestion, and bad planning) and the possibilities, illustrated by good cycle facility design and its use by people of all sorts. 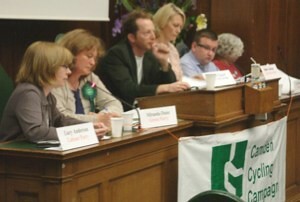 Daniel Glaser chaired the meeting and each of the candidates set out their stance on walking and cycling. After that, the meeting was opened to questions from the floor. As mentioned in an earlier email, Brian Coleman sent as substitute (Margot James) at the last minute and without any explanantion. There was quite a lot of discussion of this matter and of his record in Barnet with removing speed humps and cycle facilities. I have left that out in the report below. 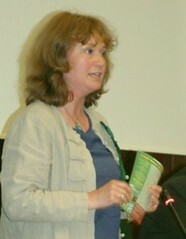 Lucy Anderson (Labour) referred to her work setting up the road safety scrutiny panel and in safer routes to schools. She praised Ken Livingstone’s encouragement of walking and cycling with the LCN+, the maps and the introduction of the congestion charge. Also the success with buses. Motor cycles in bus lanes. Thinks them unsafe. A London-wide 20 mph limit In favour of 20 mph in residential areas – maybe not everywhere. HGV dangers to cyclists. HGVs a vital issue. London-wide 20 mph limit –in residential areas, maybe not everywhere. Targets for cycling – defended council’s record but supports reallocation of road space. Speed humps – they are foolproof. Walking at Brent Cross. – scheme very poor. Congestion charge – It is good, should be enlarged. Buses – make more accessible, use CCTV. Should have buses in Oxford Street. Regents Park outer roads – interested. Role of Corporation of London as manager of Heath – just said a labour representative would be the answer. 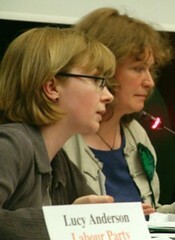 Miranda Dunn (Green) Urged us to vote on the Green list. The greens will promote walking and cycling. They have made a consistent stand against lorry freight, PFI and multinationals. They would cut road building and make roads more friendly for pedestrians and cyclists. Motorcycles in bus lanes. No. A London-wide 20 mph limit is in manifesto. HGV dangers to cyclists Policy to work with operators and have more freight off road. Targets for cycling- cancel new roads, complete LCN+, increase cycling fourfold. Enforce cycle lanes. Speed humps – in favour. Walking paths taken by cycle routes – pedestrians must have priority. Congestion charge – up to M25 with various charge levels on areas and vehicle types. Buses – against closure of Oxford Street. Regents Park outer roads- don’t close them, Role of Corporation of London – OK.
Margot James (Conservative). Spoke of reconciling needs of all road users. Referred to Steve Norris’ plans to encourage walking and cycling. Congestion charge – Norris (conservative mayoral candidate) policy to abolish it. A London-wide 20 mph limit – Supports 20 mph limit around schools and other places where there are vulnerable people. HGV dangers to cyclists – HGV drivers need more training and better mirrors – not cameras. Speed humps – too many in Camden, applauds Barnet for removing them. In favour of enforcement where accidents happen. Walking at Brent Cross. In favour of better pedestrian access. Regents Park outer roads– sympathise but would need to investigate. 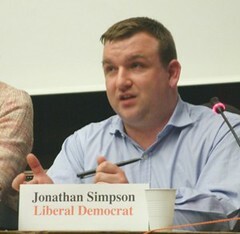 Jonathan Simpson (Lib Dem). Spoke of the lack of facilities in the north of the borough. Lib Dems support the LCC manifesto. They want to pedestrianise Oxford Street and supply journey time information for walking. Motor cycles in bus lanes. Referred to the experiment with in Finchley Road and supports it. London-wide 20 mph limit. Supports 20 mph in centre, not on main roads. HGV dangers to cyclists. Will look into the HGV camera scheme – also for bus drivers. Targets for cycling- cycling proficiency training, increase number of cyclists. Speed humps – use other forms of speed limiting as well. Walking paths taken by cycle routes – Encourage walking in High Streets. Congestion charge – not to be extended to Kensington and Chelsea, allow it to be extended im boroughs such as Camden that already have it. Regents Park outer roads – supports scheme. Role of Corporation of London as manager of Heath – absurd – they are unaccountable. 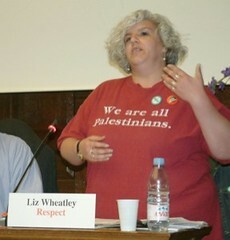 Liz Wheatley (Respect). Supports the LCC manifesto. Pleased C charge increased cycling, wants more cycle storage in peoples homes and work places. Has worked in that area for Camden Council. Interest in safe routes to schools and training. Speed enforcement with cameras. Improve pavements for blind people. Transport should be a service – not for profit. Motor cycles in bus lanes No comment. HGV dangers More training for HGV drivers. Targets for cycling – provision for storage in houses and work places. Slowly take roads over from cars. Congestion charge – extend area and charge according to vehicle size. Standardise buses and make them more usable for people with minor mobility disabilities. Traffic out of Covent Garden at weekends. Alix Stredwick writes about the Joint Women’s Design Service/Camden Cycling Campaign ride. Well the weather did us a favour and despite threatening skies on the brink of repeating the week’s dreadful downpours, there was no rain until the final few minutes. Indeed the sun was coming out as we gathered outside the New Goodfare Restaurant on Parkway near Regents Park at 11am (a respectable time for a Sunday). Eight women of various ages and abilities were ready to see what the borough of Camden can offer by means of dairy refreshment. On the back of this sociable and confidence-boosting ride, WDS aimed to do informal audits of the cycling facilities (or lack of) on the route. We set off north up Arlington Road where we were immediately confronted by a road closure. The new traffic table being put in didn’t stop us and we continued up the hill towards Chalk Farm. We dog-legged round the back of Safeway’s to take a quiet route which originally led to Marine Ices on Chalk Farm Road, but we decided to press on and save this delight til last. Over the pedestrian/cyclist only bridge to King Henry’s Road we pedalled, turning right to go up another hill (a recurring theme). Straight on over Adelaide Road we trundled, to Swiss Cottage where a well-intentioned yet rather messy pedestrian/cyclist crossing led us to Baskin Robbins which was – shock horror – closed! An executive decision led us to decamp to Choco Bar opposite (Northways Parade) for some fantastic coffee, coissants and Belgian patiserie chocolates (which we actually resisted). We liked the decor and the Italian waiter, who spotted that we arrived by bike. He recounted to us his cycling tales of pleasure and pain in London with his daughter. Baskin Robbins was still not open after its official time of 12 noon so we gave up on that one and headed north-west towards Hampstead Heath. A lovely pedestrian/cyclist-only square greated us at Belsize Park and we marvelled at the grand town houses (well those of us for whom buying a London property is out of reach, oggled indeed!). The scenic route (ahem) led us to the Heath where we squelched over the mud and were polite to pedestrians. The British Heart Foundation were holding a sponsored fun run (or, ‘run/walk’ as advertised, for those less inclined to exertion!). As we bought some of their charity roses we told them we were supporting our own hearts by cycling. The Heath’s hills were somewhat challenging but the views were worth it. Some of us were itching to take mountain bikes down the steep ‘off-piste’ parts, but for bikes they’re sadly off-limits. At the Spaniard’s Road exit we took an opportunity of courteously stopped cars to take an unofficial route through the North End of the Heath to North End Way, a busy road clogged with traffic even on a Sunday. We used the footpath to go down the steep hill towards the lunch stop, Golders Hill Park Refreshment House. Here we had lunch and swapped cycling tales and did talk about other topics honest. The sun wasn’t quite ready to stay out for us so we were getting a bit chilly by the time everyone had dutifully filled out the ride feedback forms. Going back the way we came we then continued along East Heath Road where we enjoyed the freewheel through to the heart of Camden. From the busy Malden Road we went down the back streets to end up at Marine Ices back in Chalk Farm. Parking our bikes yet again (what a D-lock palaver) we sat inside and ordered various delicious sundaes. The orders were a bit mixed up but on the whole everyone was satisfied (I think – well not much ice cream was left over I can tell you). We had a lovely easy sociable time and went just over 8 miles. Thank you to everyone who came along, making it so much fun, and easy-going.